Computer-aided visualisation has played an essential role in helping students construct a better understanding of molecular interactions over the years. However, students still need to translate 2D images on a screen into 3D molecular structures in their minds, and they often find it challenging to develop a clear mental picture of complex molecules. As an alternative platform for molecular visualisation, immersive virtual reality (VR) holds great promise for addressing students’ difficulties. To examine the educational possibilities and limitations of immersive VR environments, we adopted a design research approach. We developed a series of learning activities to teach students about an enzyme and its interactions with substrates and then conducted a user study in an immersive VR environment. Twenty-two first-year university chemistry students participated in the user study. 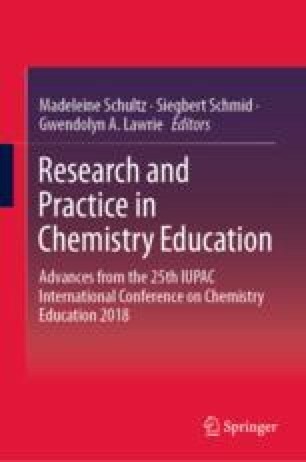 Their VR sessions along with pre- and post-interviews were video-recorded and later analysed to understand how various features of the immersive VR activities supported and impeded students’ conceptual understanding and their ability to visualise molecules. Future research directions and the implications for chemistry teaching are discussed. This project was supported by the Research and Innovation Support Program (RISP17-02) at the School of Education, Curtin University. Adam Mathewson and Jesse Helliwell contributed to the development of the VR application. Jianye Wei and Vergel Mirana contributed to running the user study sessions. Hyerin Park synchronised the video and audio files for analysis. Curtin HIVE (Highly Immersive Visualisation eResearch) provided technical support and hosted the user trial sessions for the project.